The current standings in the Sooner Athletic Conference are staggering. Rogers State women (13-7) sit comfortably in fifth place, one game behind John Brown (14-6) and as much as five games behind conference leader Oklahoma City (18-2). From the sidelines, the Hillcats are having a knock out season. RSU women have defeated three nationally ranked teams, No. 15 Langston University, No. 19 Lubbock Christian and for the first time in program history No. 2 Oklahoma City. The Hillcats have also taken down Oklahoma Baptist twice this season for the first time ever. However, going into post season will still be a tough battle for the Hillcats. After a 10-day layoff due to snowy conditions, the Hillcats played their best basketball game of the season upsetting No. 2 Oklahoma City Stars. Junior Angie Criner led all scorers as she tied her career-high with 24 points. Senior Candice Stewart recorded her fifth double-double of the season with 10 points and 10 rebounds. Sophomore Logan Froese also chipped in 10 points and senior Cortney Crockett added 15 points. Criner’s performance was rewarded as the SAC Player of the Week for Feb. 7-13. During that week, the Jenks, Okla. native averaged 19.5 points, four rebounds, 3.5 assists and three steals per game. 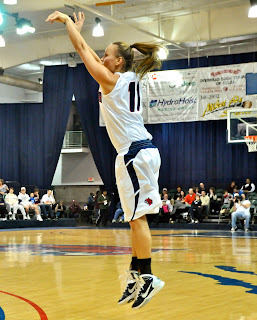 She is the first player to earn player of the week accolades this season for the Hillcats. RSU women shared another milestone with senior guard Hunter Peterson this season as she made history passing the 1000 career point mark in the win against Oklahoma Christian. The four-year veteran ended the night with 14 points. Peterson averages 8.6 points per game shooting 38% from the field and 33.6% from three-point range. Though RSU is seated fifth in conference, they are looking to claw their way to the top heading into post season. “It may be ugly, but we can fight our way to a championship game,” said Criner. The SAC tournament is set to tip off in Oklahoma City, Okla., March 3-5. The NAIA National Tournament will be held March 16-22 in Kansas City, Mo. For more information on SAC Tournament game schedule follow the Hillcat Athletic Website.